[Matt's Messages] "Jesus Said To His Disciples..."
After one week off, we’re back to our study of the Gospel of Luke which we’ve called “Certain of Jesus” because Luke wrote his gospel so that we might grow in our certainty about who Jesus is and what Jesus taught, what Jesus did and what Jesus wants. Certain of Jesus. What we have in verses 1 through 10 of Luke 17 is a series of loosely connected teachings that are aimed at disciples, followers, students, learners, disciples of the Lord Jesus. Jesus is teaching His followers how disciples should act, how they should think, how they should believe. And Luke has faithfully recorded these teachings here for us in one place. Five things that Jesus said to His disciples. #1. WATCH YOURSELVES. Listen again to verses 1 and 2. These are really strong words. Some of the strongest words ever uttered by our Lord Jesus. But what exactly is he talking about? Jesus is talking about someone (perhaps a professing disciple, someone who says that they are a follower of Jesus) that causes someone else to sin–tempts someone else to sin, puts a block in front of someone and causes them to stumble over it, falling on their faces. That sort of thing is bound to happen, but it shouldn’t. And WOE to the person who actually does it. Jesus is a master teacher. What an image! A millstone, a great big heavy circular stone used for grinding the grain, tied around the neck and thrown into the sea. What’s going to happen? The certainty of drowning. That would be BETTER than what will happen to someone who causes one of these “little ones” to stumble. Now, who are these little ones? In a very similar passage in the Gospel of Matthew, the “little ones” are children. Little children who are led down an evil path by someone and caused to stumble, led into sin. And that’s possible here, as well. But there are no little children in the context. And I think that the temptation to sin, the offense, the stumbling block here is false teaching–a false gospel. The sin that Jesus and the apostles were the most concerned about was the sin of apostasy–the sin of forsaking Jesus and His way of salvation–His gospel. And if a so-called disciple were to lead a newer disciple off of the path of the true gospel and into the path of a false gospel–woe to them that did that! It would be better to die a painful death than to face the wrath of God against those who lead people to forsake Jesus. I think that’s the right approach to these two verses. It’s like the Apostle Paul at the beginning of Galatians. In the book of Galatians, Paul is very concerned about the young Galatian church because they have been seduced by false teachers who have said that Jesus is okay but He’s not enough. It’s got to be Jesus plus circumcision. Jesus plus our good works. Jesus plus our performance. Jesus plus our efforts. But Paul says that that is a false gospel and he pronounces woe upon those who teach it. Doesn’t that sound like what Jesus says here in Luke 17? The application is clear. Watch yourselves. You and I need to be careful about what gospel we believe and share. Because the consequences of our gospel are eternal for both us and them. What gospel are you believing and sharing? Only one gospel saves–the gospel of Jesus Christ and Jesus alone. #2. REBUKE YOUR BROTHER. Look at verse 3. Here’s how disciples are supposed to act. They are supposed to rebuke one another. Now, almost nobody like this. Almost nobody like being rebuked. And almost nobody likes giving out rebuke, and they when people do like it, there’s something wrong with them! But rebuking should not be unusual for disciples of Jesus Christ. We know that we’re going to sin. We are sinners. And we know that our sin needs checked. We need accountability. We need help to cut it out. We’re often blinded by our own sin. Sin is deceitful, and we can’t see how we really are. We need each other to help each other. If you truly love someone, then you will not let them wallow in their sin forever. Now, this doesn’t mean to not overlook offenses. It’s a glory to overlook an offense. But not always. Sometimes, if we love someone, we need to rebuke them. That’s a big part of being a parent. It is! Showing your children where they are wrong is a big part of what it means to be a parent. Rebuke is a big part of being married. My wife regularly rebukes me. And I’m glad she does! Not when she’s doing it! But I need it. I need to be told where I’m wrong. Last week, at one point, I failed her miserably. And it was a lack of leadership. I failed to take leadership. I abdicated my leadership responsibility and left her hanging. And she had point it out. Thanks a lot! Disciples rebuke other disciples. Instead of leading someone into a stumbling blocks, we warn each other of the stumbling blocks ahead of us. We must do it in love. Rebuke without love is empty and painful and ineffective. But rebuke fueled by love is obedience to Jesus. They don’t just point out someone else’s sin and then run away. We forgive as the Lord Jesus forgave us. He is the master, we are His disciples. If he forgives, then so do we. And not just once. Again and again. Now, this is no excuse to sin against someone the same way seven times a day. There is no excuse for sin. This is a call to be gracious. To be magnanimous. It’s a call to be forgiving. To forgive means to promise to not let this offense stand between you. To release someone from the debt created by their sin against you. And it’s bound up with love. But that’s not right. Love says, “I’m sorry” over and over and over again. Because we are (all of us) big-time sinners. Now, full forgiveness is only possible if your brother repents. Notice how in verse 4 he comes back to you again and again. But we should be ready to forgive all of the time. Because of how forgiven we are. I thought about just preaching verses 3 and 4 as their own message on relationships. Most healthy relationships–especially marriage–are based upon applying these two principles over and over and over again. Sin is a given in all of our relationships. The question is, how will we deal with it when it comes. Not if, but when. That’s what Jesus said to his disciples. Lord, how are we supposed to do that? Don’t you know how hard it is to forgive someone? #4. HAVE A LITTLE FAITH. Aren’t Jesus’ images so amazing? Here, it’s not a millstone, but it’s still the sea. Say to the mulberry tree, “Be uprooted and planted in the sea” and it will obey you. If you only have faith as small a mustard seed. It’s not the quantity of the faith, it’s the quality of the faith. It must be genuine. And you must exercise it. The way to increase your faith is to act on it. Now, I don’t think that Jesus is being literal here. He never told a tree to do that trick and a disciple has never done it either. I think he’s saying that amazing things can happen when you believe. Unexpected things can happen when you believe. Including loving rebuke and gracious forgiveness! Amazing things can happen when you believe. Now in verses 7 through 10, Jesus takes a little bit of a different tack. He’s still talking to His disciples, but He’s got a particular problem in mind–legalism. Specifically, Jesus is concerned that His disciples don’t fall into the trap that the Pharisees have often fallen for–of believing that God owes us something because of our obedience to Him. The myth of merit–believing that God owes us something. Jesus said to His disciples, #5. DO YOUR DUTY (BY GRACE). Jesus tells a parable, starting in verse 7. Again, Jesus is guarding against the temptation to think that just because we’re disciples, and we’re obeying and doing our disciple-thing, that God somehow owes us something. That’s what we call a “works-righteousness” approach to God. Or legalism. But Jesus’ parable emphasizes two things. 1. We should do our duty. We should do what we’re supposed to do as disciples. And in the context, that’s watch yourself, rebuke your brother, forgive your brother, and exercise a little faith. That’s a false gospel, too. The second thing Jesus’ story does is to show us that we are unworthy even to be His slaves. How did we become His servants? The unworthy being given what we don’t deserve. So, do your duty by grace, out of grace, because of His mercy, because of His grace. But, you know what, it gets better than that. Because Jesus, our master, actually does serve us. Remember how Jesus acted at the Last Supper in the Upper Room? How He washed His disciples feet? The most amazing thing is that Jesus actually does serve us. Not because we deserve it, but because He loves us and lavishes His grace upon us. We are servants, but not just servants. We are actually God’s adopted children! What more reason do we need to do our duty? Grace is all that we need. We are unworthy, but He is amazingly gracious. Have you trusted in Jesus for salvation by grace? It’s the only way to live! Let me end by asking you a trick question. Today is a great holiday. What great holiday is it? Now, remember, this is a trick question. What great holiday is it? Reformation Sunday marks the day in 1517 when Martin Luther, a catholic monk and teacher, nailed his 95 theses to the church door at Wittenburg starting what became known as the Protestant Reformation. That was October 31, 1517 AD. The medieval church had gotten off track, and Luther was trying to bring reformation to it–to get the church back to what it was originally intended to be. What Luther was most concerned about was what gospel was being preached. So, Luther started something big on this day 493 years ago. With his 95 Theses, Luther was saying with our Lord that stumbling blocks, false gospels may come, but WOE to those through whom they come. Salvation is found in the Scriptures Alone, by trusting in Christ Alone, through Faith Alone in Grace Alone to the Glory of God Alone. That’s the only way that we will be able to loving rebuke our brothers and sisters in Christ and the only way that we can forgive them–because of the forgiveness that Jesus gives us. That’s the way of faith. Just a little of faith (alone in Christ alone!) can miraculously save us. Not because we’re worthy. We are unworthy. Let’s stand together and sing the most famous song by Martin Luther. #26. It’s a celebration of the true gospel–in Christ alone. He’s is the “one word” that fells the devil and is above all earthly powers and doesn’t live because of them. Jesus is the “one word” that makes the difference in everything. So that goods and kindred may go (things and family may go) and even our mortal lives. Because God’s truth lives on. His kingdom is forever. That’s what Jesus says to His disciples. [Matt's Messages] "Great Is Your Faithfulness"
Thank you for praying for Heather as she traveled home last week and got to spend time with her mom. It was a great visit. Her travel was pretty smooth, and it’s great to have her back. Thanks for praying for the kids and me this last week as we lived without mommy. The kids had a great time with their grandparents–who are here today! Thank you. And I had a great week spending time with many of you. I didn’t get to visit everyone in the church–and if you didn’t get a visit this week–and you’d like one– just speak up! Visitation is one of my favorite pastoral activities. And I’d love to visit with all of you as time allows. For me, it was the stillbirth of our first child, Charis Mitchell. It happened in 1999, and I remember so much of it vividly and painfully. What is the worst thing that you have suffered? Last February, we got the call that Heather’s mom had stage 4 cancer, probably had it for years and it had gone undetected. She’s gone through 5 rounds of chemo and now there is nothing medically left to do. Just live her life out. Did you know what to do with it? Did you have a category for it? The worst thing that ever happened to Jeremiah was the exile of Judah and destruction of Jerusalem. In the year 586 BC, God brought judgment upon the nation of Judah. He had promised exile and warned of judgment for hundreds of years. And Judah had, by and large, ignored those warnings. And in 586 BC, God kept His promise to bring disaster on His rebellious people. The King of Babylon, Nebuchadnezzar, sacked and destroyed the city of Jerusalem. And he wrote about his suffering in a little book tucked away between the major prophets called Lamentations. We’re going to take a break from the Gospel of Luke and today look into the book of Lamentations in the Old Testament. We’re going to read the most famous verses in the book of Lamentations. We sing the words of these few verses all the time. They are very familiar. But their tucked into the very middle of the one of the saddest books in the whole Bible. I mean, the name of the book is Lament. Which basically means to be sad. “Sad-Thoughts” is the name of the book. Lamentations. And that’s great. We need books like Lamentations. We need books like Lamentations. One of the most amazing things about Lamentations is how it is structured. 4 of the 5 chapters of Lamentations are a acrostic poems. Do you know what an acrostic is? But Lamentations is even more carefully structured. Jeremiah (who I believe wrote this book, actually formally anonymous, but most people believe that Jeremiah wrote it, Jeremiah) put meticulous thought in how to express his grief and sorrow and pain over what had happened to him and his beloved city. Someday, we’ll do the whole book together, and we’ll learn a lot of different principles about responding to suffering. Today, we’ll see just a few, perhaps the brightest. The whole book calls for careful study. But today, we’re going to read verses 19 through 24 of chapter 3. Have you found it? Because of the LORD's great love we are not consumed, for his compassions never fail. It’s right there in verse 23. That’s where we get our songs. Right here from that verse. Lamentations 3:23. Nearly every Celebration Sunday, we sing Hymn #43, “Great Is Thy Faithfulness.” We’re going to sing it in just few minutes again. Its come right out of this passage. Which isn’t a passage about good feelings. It’s a passage about Bad Feelings. A passage about Sad Feelings. A passage about suffering and lamentation. Things are going well. The worst thing that he could imagine has happened. You will be healthy, wealthy, and well-liked. The Bible paints a realistic picture of life which includes suffering and sadness. And it even gives us patterns to follow those times of suffering and sadness come. Divine patterns. I love that about the Bible. We call this Celebration Sunday, and we celebrate 118 years of God’s faithfulness to our church family. It hasn’t always felt like it. Our church has gone through some pretty rough times. We’ve faced times when the money was scarce, when attendance dwindled to almost nothing, when the membership was only 7 people, and only 3 of them had jobs. We’ve gone through conflicts and church splits. The most painful one was in 1992-93. And just my mentioning it probably fills many of you with some painful memories and uncomfortable feelings. It’s not always felt fine and dandy at Lanse Free Church. But God has always been faithful to us. Every one of those 118 years. Every day of those 118 years. Every single day. The word for “love” there in verse 22 is “hesed.” It’s the word for God’s covenant love. His unfailing love. His love that is promised to His people and can be counted upon no matter what. His steadfast love. He doesn’t get up some days on the wrong side of the bed. I love the picture of verse 23. Everyone does. Yesterdays mercies are yesterday. And God has promised new mercies every morning. So we have to go looking for them. I was at the Gisewhites on Thursday, attending their Link Group–which is an excellent Link Group, in case you’d like to join one. They are studying the book of Isaiah and there was a great discussion about God’s Word there. And I noticed a plaque on the Gisewhite’s wall. I was facing it, so I was staring at it the whole meeting. It may not be on our time-table. It may not even look like what we expected. Okay, so what should we do about that? How do we live differently because we’ve read these few verses? It doesn’t necessarily change how we feel. Jeremiah has two and half more chapters of lamentation to go! What difference does it make that God is faithful? What should we do? Notice that this is a prayer. He reminds himself that God has great steadfast love and great faithfulness and that it is worth it to endure the suffering (which will last for moment) because joy will last forever. Hope in him. But our feelings can be deceived. Jeremiah wrote this to be read by others. To be (in some cases) sung by others. But we need songs like this. We need dirges. Because life hurts! He didn’t know about the Suffering Servant. He didn’t know what we know about the Messiah. He felt like Lamentation in the Garden of Gethsemane and on the Cross of Calvary. It’s because He was the very embodiment of the steadfast love of the Lord. His death and resurrection was God keeping His promises. What’s the worst thing has every happened to you? Do you know how to respond to it? My favorite mother-in-law is only 59. That seems way too young for what she’s got to go through right now. But this is how she’s handling her illness. The Story Behind "Great Is Thy Faithfulness"
Can't say that there never is any good news out there. My favorite mother in law was featured today in the Airdrie Echo. [Matt's Messages] "Jesus and the Great Chasm"
For several chapters now, Jesus has been teaching his disciples and fighting with the Pharisees. He’s been teaching (among other things) about the surprising Kingdom of God, God’s passionate love for lost people, and the dangers of loving money. And the Pharisees have responded to this teaching by sneering at Jesus and ignoring God’s word. So in today’s passage, Jesus tells yet another story about the same things–and this one is all about the danger of ignoring God’s Word. Jesus tells the story of the Rich Man and Lazarus. The Rich Man and Lazarus. It’s probably a familiar parable to most of us. It’s a story about the urgency of getting right with God now while there is still time. It’s a story about two people who end up in very different (and surprising) places. Two people who are separated by a great chasm, a great gulf, an unbridgeable space. A fixed, terrible, and irreversible chasm. Jesus is the most amazing storyteller there ever was and ever will be! The story starts in verses 19-21 with the introduction of the two main characters: the Rich Man and Lazarus. These two men couldn’t be more different in circumstances. He lives in the lap of luxury every single day. Is that bad, that he had good things? Is it bad to rich? No. Not necessarily. It makes things harder [(v.13), you cannot serve both God and money. ], but it’s not necessarily bad. A stark contrast if there ever was one! This man, Lazarus (not Mary and Martha’s brother but another Lazarus), was probably crippled (he had to be laid at the gate). He was suffering terribly with open sores, and was desperately hungry. Reminds us of the prodigal son, right? Who wished that he could eat the pig’s slops? Lazarus wishes that he could eat the dog’s food. There are dogs here. These are probably guard dogs or wild dogs. People didn’t just keep dogs as pets back then. And they are very unclean. And they are licking his sores. Yuck! It might have been compassionate that they did that, but it’s still gross. If it was compassionate, the dogs are the only ones showing Lazarus any compassion. The rich man has absolutely everything but does absolutely nothing. Now the story is going to change. Incredibly. Death comes to both characters in Jesus’ story, but it is not the end for either of them. Both die, but they end up in radically different places. We don’t use that word “bosom” much today. It means “side” and particularly the chest. Near to someone. Here, it’s really a banqueting term. Remember, in the Ancient Near East it people reclined at low tables like spokes on a wheel, and if you wanted to talk to someone, you would recline backwards towards them an turn your head to talk to them. The Apostle John talked intimately that way with our Lord at the Last Supper. The Last Supper was not like Michelangelo’s famous painting. John was in Jesus’ bosom. And here, the picture is that of a great feast, presumably in Heaven. And Lazarus is right up there, right near Father Abraham, the greatest Father figure of the Jews. Lazarus has made it to blessing. We would say, in our terminology, that Lazarus was in heaven. Remember, the kingdom is a party, and Lazarus was now partying with Abraham. He went from the bottom of the world to the top of Heaven. Interestingly, Lazarus never speaks in Jesus’ story. He suffers too much to speak in the first part, and I think he’s too happy to speak in the second part of the story. He has doesn’t have to speak, because Abraham speaks for him. And Abraham, interestingly enough, speaks in this story for God, as well. It definitely was hell for this formerly rich man. He is not rich any longer. He now has nothing and is in painful torment. And this man can see Abraham and can see Lazarus, and I think he can see how happy Lazarus is. Their positions are now switched. There is a surprising and complete reversal between these two men. Now, don’t work up some compassion for him. This man is (we have seen and will see) getting what he deserves. Notice that he talks to Abraham. Calls him “Father.” He expects his racial connection with Abraham to help him out. He is a Jew, after all. And notice, especially, that he doesn’t talk to Lazarus (even though he knew his name! He knew his name but hadn’t done a thing to help him! He doesn’t talk to Lazarus), but actually has the audacity to ask Abraham to send Lazarus like some kind of a servant boy to give him a dip of water on his tongue–the tongue that feasted sumptuously every single day. But he had never lifted a finger to relieve Lazarus’ suffering with even a table scrap. I think that that’s the thing that surprised me the most as I studied this story this week. He is in agony, but he’s not repentant at all. And he still thinks that he is above Lazarus and that others ought to be serving him. It’s easy to get used to be rich and take for granted the perks that come with it. But this man had paid no attention to God or God’s Word all of his life, and though he has now begun to pay for it, he hasn’t changed his mind at all. Now, I don’t know how many of these details we are to take literally. I doubt that people in Hell are now talking with Abraham. This is a parable. But parables are supposed to teach things. And if this parable teaches anything, it teaches that there is a great chasm, a great gulf fixed (irreversible) between blessing and judgment in eternity. There is a great chasm between Heaven and Hell and no one in eternity cross over from one to the other. It is an unbridgeable divide. Fixed. So that when you get to eternity, there is no going back. No second chances. It is too late. Let’s read those two verses again. It is too late. It is too late. Those are frightening words. Those are sobering words. They are supposed to stop us and make us think. Whom is Jesus telling this story to? Well, in the context, he’s been teaching His disciples, and He’s also been fighting with the Pharisees. He’s not teaching dead people. He’s talking to living people before it’s too late for them. And you don’t know when it will be. But it will come, and when it does the results are irreversible. Fixed. And what you do now is what counts. We’re going to have four points of application today. #1. NOW IS THE TIME TO CARE FOR THE POOR. It’s one thing that the Rich Man had completely ignored. The Scriptures are clear about how God wants us to treat the poor–compassion, mercy, generosity, care. And you can’t do that in eternity. It’s something you can’t do after you die. Now is the time to care for the poor. Now, don’t get me wrong. You can’t earn your way to heaven by giving your money to the poor. We’ve seen that already in this book. But we’ve also seen that if you love God, you will love people, but if you love money, you will just love yourself. Money can be such a false god! Mammon. Mammon wants us not think about eternity. Not think about the world to come. Mammon wants us to just enjoy ourselves now and not think about other people. Especially those pesky poor people. But a “great chasm has been fixed” between judgment and blessing. And so, now is the time to care for the poor. We might like to think of ourselves as poor! But everyone in this room is richer than that rich man in Jesus’ story. We all have purple things and fine linen. And eat really well. And don’t worry about where our next meal is going to come from. Raise your hand if know you’re going to have lunch today. Raise your hand if know you’re going to have lunch tomorrow. Raise your hand if know you’re going to have lunch every day this week. By the world’s standards, we here, are all very rich. And so we better be thinking about the poor. I love these shoeboxes. They are a great way of applying this passage to our lives. They are going to go to “Lazaruses” around the world. Now, is the time to care for the poor. Soon, it will be too late. #2. NOW IS THE TIME TO WARN PEOPLE ABOUT HELL. That’s what is on the man’s mind in verse 27. Notice again, that he expects Lazarus to serve him. He wants him to go (as a ghost perhaps or in a dream or something?) back to Earth to his dad’s place to miraculously pass on the message of the great chasm. He wants his 5 brothers, who are also Jews, to hear the warning that he sends. Remember who is listening. Remember last week, that the “slightest stroke of a pen” won’t drop out of the Law, but the Pharisees had been ignoring God’s Word. The man reasons that surely he himself would have repented if he had had a personal miracle. But Abraham knows better. It’s a heart-problem, not an information problem. Miracles don’t necessarily convince people. Remember the other Lazarus? Jesus raised him from the dead. How did people respond? Some rejoiced and believed. Others tried to turn Jesus in to the authorities. Hard hearts aren’t convinced even by miracles. No, Son, you should have listened to the Word of God when you were alive and talked to your brothers then. Now is the time to warn people about Hell. There is a great chasm fixed between heaven and hell. Fixed. And now is the time to warn people. You and I have to tell people about Hell. I’m struck by all of the suffering words in this short story. Hell is real, and it is really coming to real people. And now is our chance to warn them. After we die, it’s too late. Now is our chance to warn people. And more than that–to invite people. #3. NOW IS THE TIME TO INVITE PEOPLE TO HEAVEN. Telling lost people about Jesus. 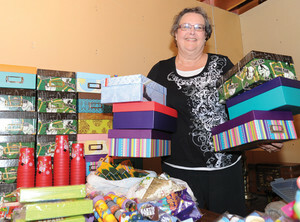 Every shoebox that we send has a gospel presentation in it. Because the gospel is more than just don’t go to Hell. It is come with me to Heaven through what Jesus did for us on the Cross. Now is the time to believe God’s word. Moses and the Prophets. They pointed to Jesus. And He is the way to Heaven. We need to invite people to turn from their sins and put their trust in the Savior who rescues people to go to Abraham’s side. There is a great chasm fixed–and we need to NOW encourage people to choose which side they are on. What are you and I doing these days to reach our lost friends, neighbors, co-workers, and family members for Christ? We’ve seen Jesus’ heart for the lost. What is our heart for the lost? Next Sunday, I want to invite you to our church family meal and meeting. One of the things we’re going to be talking about at that meeting is how we, as a whole church, as a team, can reach out more to our community. To invite people to come with us to Heaven through what Jesus did for us on the Cross. Come to that meeting and bring your ideas and thoughts and your prayers and your hopes and your vision. Now is the time share the gospel with those who need to hear it. And #4. NOW IS THE TIME TO REPENT. Did you see that in verse 30? The formerly rich man knows what his problem was. He knows that he failed to repent. The point was not that if he’d been generous, he would have been saved, but that if he’d been repentant, he would have been generous. And now, there is no going back. It may not be too late for his brothers, if they read the word of God and believe it. But it is too late after you die to turn away from your sins and turn to Jesus. Now is the time to repent. If you have never trusted Jesus as your Lord Savior, now is the time. Now is the time to turn to Him, before it is too late. Because between Heaven and Hell there has been a great chasm fixed. I'm preparing to preach Luke 16 again tomorrow, and I've found this message by D.A. Carson to be so rich! I've listened to it already 3 times, and each time got some more out of the passage. Good stuff! [Matt's Messages] "Sneering at Jesus"
While you’re turning there, I want to thank you for sending Heather and me to the Allegheny District Pastors & Wives Retreat last weekend. We had a great time. It was just the right balance of fellowship, biblical teaching, and free time to rest. Thank you for sending us, for giving us the weekend off, and for paying our way. Heather and I feel very appreciated by our whole church family. And it’s good to be back with you! It is a great privilege to be your pastor and to be paid to study the Bible during the week to deliver it to you on Sundays like a chef preparing all week for one great big feast. It’s time now to feast on God’s Word in Luke chapter 16. We’re in the middle of chapter 16, and we’re going to study five verses that can be easily overlooked. Verses 14 through 18. When you preach through every verse of a long book like Luke, it’s easy to miss 5 little verses like this that are hard to categorize. In chapter 15, there were lots of stories, and Jesus has already told a story in chapter 16 (the shrewd and dishonest manager) and He’s going to tell another story before chapter 16 ends: the Rich Man and Lazarus, which we’re going to study next week, Lord-willing. But it’s hard to get the point of these 5 verses that kind of bridge the gap between the two stories. Unless, we slow down and focus on them in particular. They’re not sure what to do with these verses either. One commentary I have, which is in 2 volumes, covering the whole gospel of Luke, just skips these verses altogether! But we’re not going skip them today. We’re going to think of them as a kind of bridge to connect what we’ve been learning in chapters 13 through 16 so far and what we’re going to learn at the end of chapter 16 and into the next few chapters. What are some of the themes that we’ve been learning about in the last few chapters? Kingdom is one theme. Ever since chapter 13 and especially in chapter 14, Jesus has put a big emphasis on the kingdom of God and what it’s like. The Kingdom is dawning, and it’s not what people had expected. It’s a surprising kingdom. And it’s a kingdom that is characterized by celebration. The kingdom is a party. And that brings us to a second theme: the Lost. Remember all of those parables in chapter 15 about the lost [1, 2, 3]? Something valuable is lost, someone conducts a desperate search, and then when it is found, there is a great celebration. Lost, search, found, party. Right? God the Father has a passionate love for lost people. The lost must be pursued at any cost. And that brings us to another theme: money. Two weeks ago, we studied some of Jesus’ teachings on money. Be shrewd. Be trustworthy. Be loyal. Jesus isn’t done talking about money. The Kingdom of God. Lost people. Money. Those are key themes we’ve been learning about. And all of that has been in a context of a growing hostility to Jesus by the Jewish Religious Leaders–the scribes and the Pharisees. There’s more of all of that to come. And it’s all actually right here in this little bridge text. In Luke 16:14, the Pharisees respond to Jesus’ teaching on money. And they do it in the most disgraceful way they can think of...they sneer at Him. The Pharisee go beyond disagreeing with Jesus. They go beyond opposing Him. They go beyond muttering about what they don’t like about Him. And they openly sneer at Jesus. Can you imagine? What we have here is a fight with the Pharisees. We’re looking here at a confrontation between the Jewish Religious Leaders and our Lord Jesus Christ. It’s so short, you could easily miss this one. But it’s too good to miss. The Pharisees didn’t like Jesus’ teaching on money. They didn’t like the story of the shrewd manager. They didn’t like being told to invest their money in eternity with shrewd generosity. They didn’t like to be told to be trustworthy with it because they were just stewards. And they especially didn’t like being told to be loyal–that you can only serve one master–God or money. Just think about that phrase for a second. The Greek word here, “mykterizo” literally means to “turn one’s nose up at someone” (Bock, 1349). Utter mocking contempt. Sneering at Jesus. They didn’t like Jesus one bit, and they sneered at Him. Now, do you and I sneer at Jesus? I hope not. Not intentionally, at least. I hope we love Jesus and that it shows. But let’s see what kind of a heart they had that caused them to sneer and then see if the seeds of those sneers are in our hearts so that we can root them out. You are sneering at Jesus, (#1.) WHEN YOU LOVE YOUR MONEY. They loved what money could do for them. Status, power, buying power, possessions, everything that goes with money. You don’t have to have money to love money. Some poor people are just as guilty of loving money as rich people can be. All you have to do to get into this trap is to have a heart that is inclined towards money. And when you do, you’re prone to sneer at Jesus. Because you cannot serve both God and money. Can’t do it. The only antidote to a sinful love of money is a growing love for God. And the only way to know if you’re growing in love for God instead of money is to “follow the money.” To watch where the money goes in your life. Is there generosity in your life towards what God is passionate about–which we’ve learned is the Lost? Or is all of the money flowing towards you? You can tell a lot about someone’s heart by looking at their checkbook register. One of the things I love about this church is that we don’t make money the focus of the church, but we do give people plenty of opportunities to learn the joy of giving. We don’t apologize for having “opportunities for giving” like on pages 7 and 8 in your bulletins. God loves a cheerful giver. Because it shows whom the giver really loves. You’re sneering at Jesus (#2.) WHEN YOU PUT ON A SHOW. When you put on a big religious show you’re sneering at Jesus. The Pharisees were masters of this. They went through their gardens and tithed all of their spices! And I’m sure they made a big deal of telling everyone all about it. “But God knows your hearts. What is highly valued among men (money, pride, impressiveness, religious display) is detestable in God’s sight.” It stinks. God is not impressed by our religious shows. God is not fooled by the outward exhibitions that we put on. And you and I are not immune from the temptation to hypocrisy. It’s easy to put on a show. It’s easy to get dressed up and pretend that everything in our life is right where it belongs. But the reality is that we are messed up people. We are broken. We are faulty. We are hurting. We are sinners. We are sufferers. We are needy. The answer to hypocrisy is authenticity. God wants us to be real with Him. Verse 15 says that He already knows our hearts. Why would we want to go around pretending? And, be real with other Christians that you can trust. But being real with God and being real with other Christ followers. Because what is highly valued among men is highly detestable in God’s sight. And that’s the sight that really counts! Are you being real with God? Now, I don’t think that Jesus’ audience changes at all in verse 16. I think that Jesus is still talking to the sneering Pharisees. I think that Jesus is saying that the Pharisees have been sneering at Him by ignoring God’s Word. #3. WHEN YOU IGNORE GOD’S WORD. The Pharisees claimed to love God’s law, to love God’s word. But did they? The Old Testament Law and Prophets were full of promises, not just commands. And now is the time of fulfillment! The good news of the Kingdom of God is that the promised Rescuing King is finally here! And the Pharisees are missing it. Now, that last phrase, “and everyone is forcing his way into it” is one of the hardest phrases to translate and to interpret in the Gospel of Luke. It could mean about 4 different things depending on how you translate it and how you understand its place in the context. It could mean that the kingdom of God is being attacked violently. Like the Pharisees are attacking it. That would fit with a similar passage in Matthew chapter 11. But the verse says, “And everyone is forcing,” not “but.” So it’s unlikely. It could mean that the people are trying to force the kingdom of God in the wrong way. Like when they tried to make Jesus the King by force. But that doesn’t fit the context very well, either. It could mean (translating it a little differently, in the passive voice in Greek), that “all are urged insistently to come into the Kingdom.” That’s how the footnote in the English Standard Version would understand it. And that fits the context really well. It’s very possible. But I think the mostly likely interpretation is that many people (the “everyone” of verse 16) are eager to get into the Kingdom now that they have heard the good news about Jesus. But the Pharisees are missing out. They have ignored the promises of the Old Testament, and they are missing the fulfillment of the New. You’re sneering at the fulfillment of the whole Old Testament! Anyway you understand the last phrase of verse 16, the Pharisees were missing out because they were sneeringly ignoring the message of God’s Word. These guys who supposedly loved the Law of God really didn’t love it at all! It was just a show. If they did love the Law, then they would love the Savior whom God had promised to send in the Law. But they were sneering at Him. When You Ignore God’s Word you sneer at Jesus. Do we sometimes ignore God’s word today? Well, certainly the world does. That’s obvious. But what about you and me? Are we prone to pick and choose what parts of the Bible we like and what parts of the Bible we don’t like so much? We don’t get to choose what God has said and what He hasn’t. We don’t get to just use the promises and not obey the commands. The Pharisees, strangely enough, only wanted the commands (because they thought they could earn God’s favor by keeping them in their flesh). But they ignored His promises–especially those promises that clearly pointed to Jesus. But God’s word cannot be safely ignored. It stands forever. V.17 again. The King James calls it “a tittle.” The Greek word is “keraian.” Not crayon! Do you see any difference between these two Hebrew letters? The difference is this keraian, this little tittle. Jesus says that the whole Old Testament is fulfilled down to the least stroke of a pen now in Him! It’s more likely that the Sun won’t shine tomorrow than that the Word of God will fail. Why would we ignore it? Jesus gives just one test case. Divorce. I don’t think that verse 18 comes out of nowhere. It’s an example of what He’s just been talking about. You are sneering at Jesus (#4) WHEN YOU BREAK YOUR PROMISES. Jesus is bringing in the new era of the Kingdom of God. But in some ways, nothing has changed. The kingdom is a kingdom of righteousness, which means (among other things) keeping your sacred promises. Keeping covenant. Verse 18 isn’t everything the Bible says about divorce. There are exceptions to this rule (Jesus gives them the other gospels) in cases of marital unfaithfulness (and Paul adds) abandonment by an unbelieving spouse. Not everyone who is divorced has failed to honor their commitments. We know that. But Jesus has in mind those who divorce one person to marry another. And He says that that’s no better than adultery. And if you’re a marrying into a situation like that, you’re committing adultery, too. Marriage is all about keeping your promises. And that’s not something to sneer at. The greatest threat to the family in America is not homosexuality. It’s not even homosexual “marriage,” whatever that is. It’s divorce. Especially among Christians. It’s not keeping the covenant you made before God. A threeway covenant. Husband, wife, and Lord. At Heather and my wedding, my Dad got up to the mic and shared one piece of counsel. He said that the secret to a good marriage is very simple: Marry the right person and keep your promises. And after you’re married, it gets even more simple. Because God always keeps His. Down to the least stroke of a pen. And that’s nothing to sneer at. Two great ministries that go great together! My proposal for my applied research project is ready to mail! Thank you to all who have been praying for this.